NASA's Nuclear Spectroscopic Telescope Array, or NuSTAR, has detected strange X-ray signals from the center of the Milky Way Galaxy (inset) where a monster black hole resides. Scientists suspect the signals are coming from dead stars. The remains of thousands of stars might exist in a vast graveyard near the giant black hole at the heart of our Milky Way galaxy, a region where dead stars feed on companions like zombies and unleash X-ray "howls," researchers say. Scientists have long thought that a monster black hole with the mass of 4.3 million suns, named Sagittarius A* (pronounced Sagittarius A star), lurks at the heart of the Milky Way. Recently, astronomers discovered that a surprising number of young, massive stars exist within a few dozen light-years of this black hole. To learn more about the mysterious center of the galaxy, scientists have focused on X-rays, whose the wavelengths and energies of can shed light on the kinds of activities take place at the galactic center. Previous research has suggested that relatively weak, "soft" X-rays from the galactic core mostly came from white dwarfs — the dim, fading remnants of stars much like the sun — that are accumulating or accreting matter onto themselves. Now, using NASA's NuSTAR X-ray space telescope, astronomers have the best pictures yet of the sources of stronger, "hard" X-rays from the area 100 or so light-years away from the Milky Way's central black hole. However, the nature of these X-ray sources remains a mystery. In a statement, NASA described the signals as possible "screams" from zombie stars. "As of right now, we haven't solved any mysteries about the galactic center — we just launched a new, big mystery," Perez said, who conducted this research while at Columbia University in New York. The researchers currently have four possible explanations for these hard X-rays; three of those theories involve different kinds of stellar remnants. However, each of these options presents difficulties, Perez said. If these powerful X-ray sources are intermediate polars, their presence would be puzzling. For example, if intermediate polars are the source of all this radiation, the researchers estimate that 1,000 to 10,000 intermediate polars might exist in the galactic center — about 1,000 times more than observers might have expected. In addition, the energy of these X-rays suggests that each of the white dwarfs in these intermediate polars has a mass almost as heavy as the sun's. That is substantially heavier than any intermediate polars that have previously been seen in the galactic center, which have masses that are about half that of the sun's. "If these are intermediate polars, why are they so heavy?" Perez said. "Did they form from denser clouds of gas, or did they accrete more matter? Alternatively, these hard X-ray sources might be millisecond pulsars, which are highly magnetic neutron stars that spin about 1,000 times per second. A neutron star is a dense, city-sized stellar remnant born from the explosive death of a larger star. 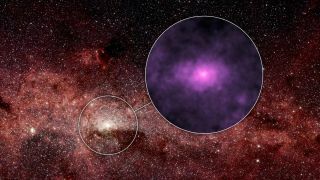 However, when astronomers look at the galactic center in other wavelengths of light besides X-rays, "we don't see as many millisecond pulsars as we would need to explain these hard X-rays," Perez said. "Still, prior research has suggested there may be millisecond pulsars hiding in the galactic center." In a third theory, these hard X-rays might come from low-mass X-ray binaries. In this scenario, one of the pair of binary stars is either a black hole or a neutron star, while its companion is either a regular star like the sun, an old star such as a red giant or a stellar remnant such as a white dwarf. However, "low-mass X-ray binaries are inherently unstable, mostly lasting on time scales of 10 years or so," Perez said. "Maybe there's something wacky about the environment of the galactic center that makes them more stable." The last possibility is that these powerful X-rays do not come from stellar remnants at all, but rather are the results of outbursts of high-energy particles known as cosmic rays, which are coming from the Milky Way's supermassive black hole and slamming into dense clouds of gas and dust. "Prior research has postulated that large flares happening on the order of 100 years could travel from the Milky Way's supermassive black hole and travel through clouds, lighting them up in X-rays," Perez said. "The difficulty with that idea is that the X-rays don't match where material is known to be around the galactic center and models that exist right now of how cosmic rays propagate." To help solve the mystery behind these powerful X-rays, Perez and her colleagues hope to use NuSTAR to look at the galactic center within the coming year. "Maybe we'll be able to narrow down these four possibilities," Perez said. Perez and her colleagues detail their findings in the April 30 issue of the journal Nature.